This description on the Ice Cream Dreams collection couldn’t be more true 😀 And one tradition I look forward to is the shimmer smackers! Yay! Ice Cream Dreams features 4 shimmers in Cinnamon Swirl, Butter Brickle (!!! ), Berry Pie, and Sugar Plum. The shiny labels are pretty (better than last years), and the scents are fun and very strong. Butter Brickle is a nice salty dessert, while Berry Pie is all berry and no bakery filler scent–thank goodness. I’m also really happy that this is the sweet Sugar Plum formula; very light with no cloying floral notes to be found. Cinnamon Swirl is a heavy toast scent that will, again, be hit or miss with people. Some of these will be familiar (looking at you, White Chocolate), but this is also a good set. Sugar Plum Frosting is amazing! I normally don’t like Sugar Plum either. The last present underneath the tree is the 6-piece Cup of Holiday Cheer tin, with flavors such as Caramel Cider, Peppermint Frappe, Snowflake Cocoa, Holiday Punch, Whipped Eggnog, and Pumpkin Latte. Let me just say this is one ambitious Holiday set. It would have been easy to axe the stranger formulas (Whipped Eggnog & Caramel Cider are something else! ), but yet here they are. I love this collection for a few reasons–mainly because these are unexpected scents, but also because they wrap-up a year of smacker induced haze. One of the most memorable smacker years ever, too. Oh, and Peppermint Frappe rules, so there’s that. I came across a set of 4 flavors (cake pops – Red Velvet Chocolate lemon cake & 2 others I can’t remember) at Target. 1 box left so it was meant to be for me. I also got the Frozen collection. Can’t wait for these holiday flavors to hit the stores. I was excited when I saw butter brickle and cinnamon swirl, but when you said “hit or miss…and smelling of toast” for the cinnamon swirl, it’s probably another fail cinn flav, am I right? Lol!! Pass. Is the sugar plum the same scent as last year? and is the sugar plum and sugar plum frosting different in scent? How does the peppermint frappe and snowflake cocoa smell? Is it a weak peppermint like last years? And does the holiday punch smell like pomegranate punch from last season? I’m just asking because if they smell similar, I don’t want to waste money buying different packaging, same scents. One more thing, have you seen or heard anything about the candy cane shaped lip gloss you posted several months ago? Hi! Yeahhh, Cinnamon Swirl is probably a pass after that debacle 😛 The sug. plums are NOT the same as last years (which was way more floral). The two formulas are also different from each other. I’m with you on the peppermint = weak train, but it works well in the frappe context. Snowflake Cocoa is kinda hard to describe, maybe vanilla cocoa? I like it. I’ll have to pull out last year’s punch and compare later. I always assume punch flavors are repeats though, even if I can’t remember haha. I think the tin flavors are pretty fun and shows they’re trying new stuff, but that’s just me. And oh yes, no sign of the candy cane gloss yet. I hope that’s still being released. The tin collection is a good throwback to the mid 2000’s smackers [someone mentioned Pet Pals……they aren’t wrong], along with some new flavors. One of their better holiday offerings in years, me thinks. I always love their specially designed tins and I hope i can find all of these at target! And Peppermint Frappe does sound really good! I miss the year stamps AND the cute holiday characters from the early and mid 2000’s . I remember there was a polar bear character, and one of his smackers was “Artic’s Candy Cane Cocoa”. I LOVED that one. I remember putting like 4 layers of it on my lips when my mom was driving me to school in the morning. Lol I have a cocoa smacker with Pluto on it and its really similar. I want them to bring back thier own holiday characters. So cute! Pet pals! I miss those too, I thought I was alone! Haha. My candy cane cocoa is pretty faded now sadly :'( I think you’ll like this new one! Pretty happy with this years set, although I was REALLY hoping for a Snickerdoodle flavor. I love Butter Brickle and everything about it down to the uniqueness of it (I assume this was them giving us a Butter Rum-ish type flavor) wish it wasn’t a shimmer though (not as moisturizing for my lips). The Cinnamon Swirl-gah! Not terrible but they still have a far way to come with their cinnamons! They were capable before, they can do it again. This one to me, is very similar to Cinnamon Sugar but a little more bakery-esque. I don’t know why they think we have eternity to sit around and wait for them to do a cinnamon right?! Maybe 2015 will be the cinnamon comeback (let’s hope!)? Love the tin for the beverage flavors, all pretty good, too! Caramel Cider is a good one for people who thought Caramel Apple was too sweet. This is a little more balanced. Peppermint Frappe, or shall we say Cocoa Frappe? Their peppermints have gotten terrible too I must say, where’s the minty-ness? Love Whipped Eggnog! Love the Angel Food Cake too! They always do those good. It’s a good one, though Snickerdoodle would have been fun you’re right! Not really picking up on Butter Rum-ish notes w/brickle but that’s a good point. I can totally see what you’re saying. The new peppermint formula works OK in the frappe context because coffee is such a strong scent already… I actually think a mild mint makes more sense. But I’m mourning the stronger mint right along with you! I’m pi!$$ed about peppermint but I am also inclined to agree that it goes well with the heavy coffee scent. Whipped Eggnog though…… cannot decide if I love it or hate it! To me the peppermint frappe is like the candy cane cocoa they always do. I like it. I like whipped egg nog its really unique and holiday fruit punch is so fruity and nice. I have close to 200 smackers. Most of them I have for sake of collecting, not really use. But I use some of them daily, whatever my mood would be. Never had a Snickerdoodle, but I’m assuming it’s a rich, buttery, brown sugary, cinnamon type cookie flavour/scent? If so, yumm! You know what Bonne Bell would do for that flavour, right? Mix the same old butter cream frosting with that bakery scent and cheap cinnamon sugar flavour they keep handing out. 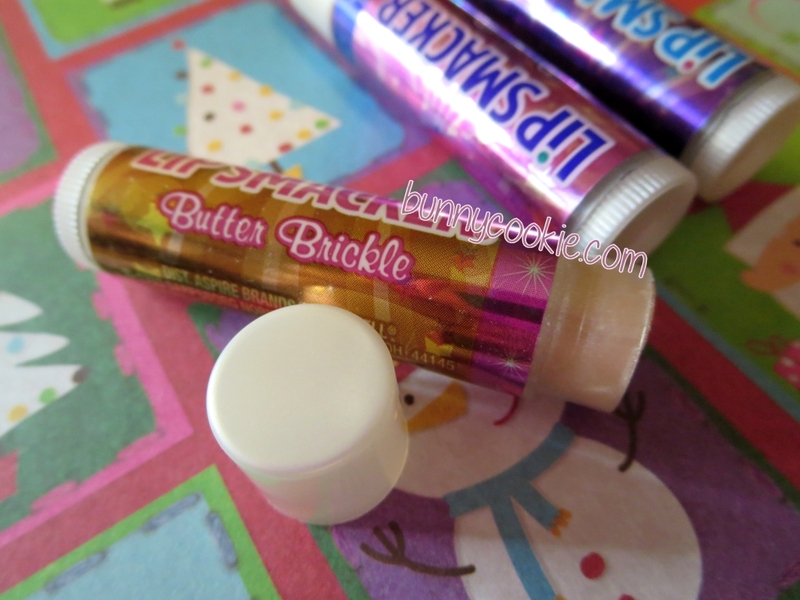 If you have a butter cream/cookie scent lip smacker and cinnamon sugar, mix them on your lips and snicker-a-doodle a way! I really want to avoid the cinnamon swirl one after the comments on here lol! I hated the cin sugar from last year. I even threw it out!! It was a slap in the face imo. After all the requests and love for the original and the new one didn’t even come close…geez. 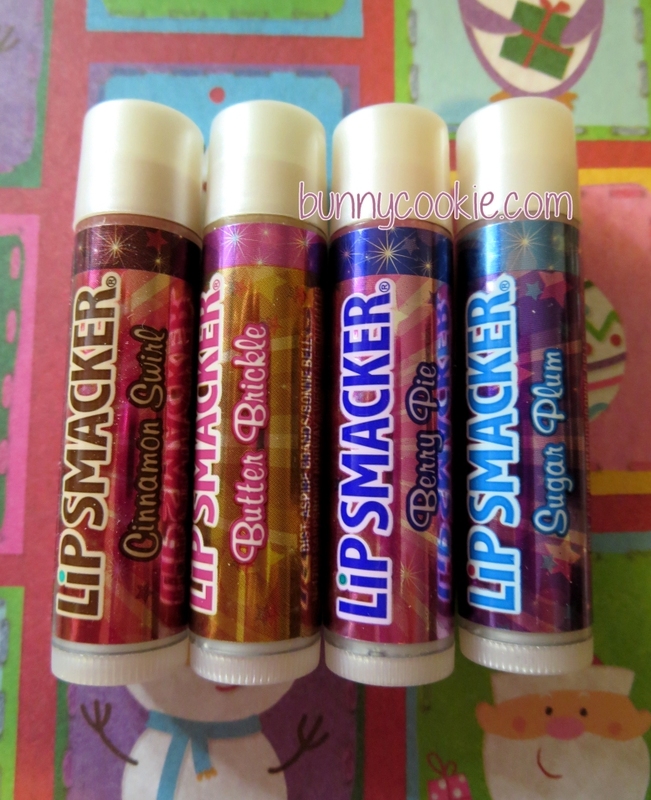 If Bonne Bell is still making Lip Smackers in 40 years, I’m going to be in a rocker, still waiting for a good cinnamon flavour…because at this rate, it’s not going to happen anytime soon. “I don’t know why they think we have eternity to sit around and wait for them to do a cinnamon right?! ” LOL! I hear ya. Life is too short! They need to get it together. To me the Peppermint Frappe is exactly like the Pluto Hot Cocoa from last year and the Paul Frank Hot Cocoa Mint flavor. A very slightly stale-ish hot cocoa packet flavor with NO mint to it. I don’t get a coffee flavor from Peppermint Frappe at all. You’re right about Snickerdoodle, they’d throw Sprinkle Cookie and Cinnamon Sugar together and call it a day, which would work if they got Cinnamon Sugar right the first time around. I was thinking the Cinnamon Swirl was an apology to us for the Cinnamon Sugar failure, but it seems like a slightly tweaked version of Cin Sug. Definitely doesn’t make up for it. Maybe more sweet. Maybe, just, MAYBE we will get a revamped version for the new year! Speaking of… I hope some of the new 2015 flavors show up in early December like they did last year on the website, now that was a great Christmas ‘gift’ from BB! That made my Christmas last year! So much flavor possibilities…anyone have any guesses on what we’ll see? Btw, finally saw the Green Apple Skittles in the party pack. Hope it’s different than the Sour Apple. Also am looking forward to Chocolate Hazelnut to start appearing. Aww, I love the hot cocoa flavors! I’m happy that it was brought back…nice mix of new and ‘old’ 😀 I swear it smells stronger to me this time around too which is great. Thanks for the heads up on Green Apple, can’t wait for that. Hey Bunny Cookie, do you remember the yule log holiday Lip Smacker from 2010? Snowflake cocoa smells just like it! I knew it smelled familiar! By the way, I couldn’t find the tin, so I found a different collection called the Holiday Refreshments collection. The sticker on the pumpkin latte is different than the one on the tin collection. The only Lip Smacker I don’t have in this collection is the cider one. I may throw out my cinnamon swirl now like you. LOL What’s so hard about bringing back a REAL cinnamon flavor like then cinnamon ice cream from the 2004 pet pals holiday collection?! I have the Bigelow cinnamon gloss from bath and body works which is a real cinnamon. I too find myself most partial to Peppermint Frappe as well as Caramel Cider. Familiar and new, how perfect. This is one of the better Christmas presents Bonne Bell has given us. Looking at these makes me feel so sad! 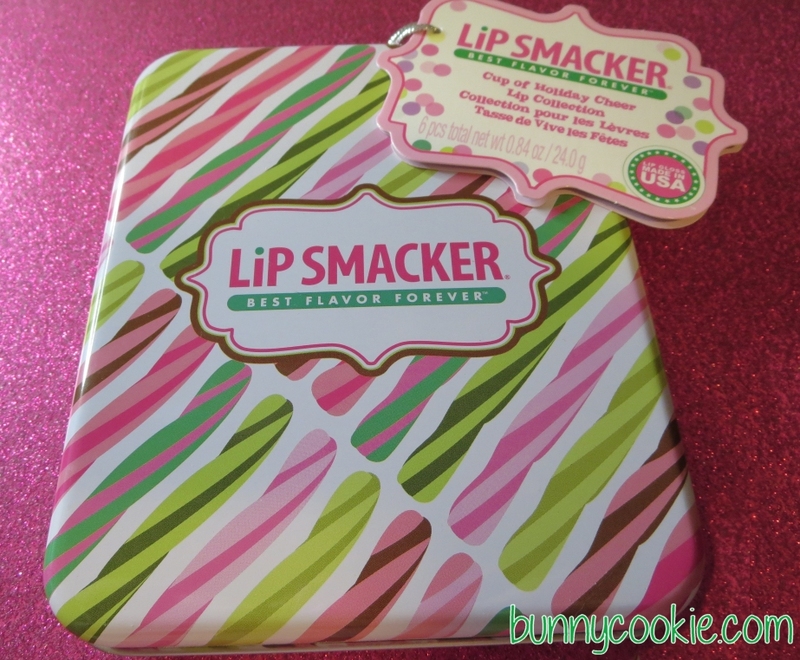 I had such a hard time last year finding the holiday Lip Smackers, and I want to be able to find the ones that come out this year. PLEASE TELL ME WHERE YOU FIND THESE! I was told to expect these in more stores around mid-October. I’d guess Target or the usual dept stores. Thanks. I hope they actually sell them in my area. I seem to have a lot of trouble finding Lip Smackers here. I wonder if the holiday punch is like the ones from 2011. It smelled so fruity and sweet. I really hope I can find these. 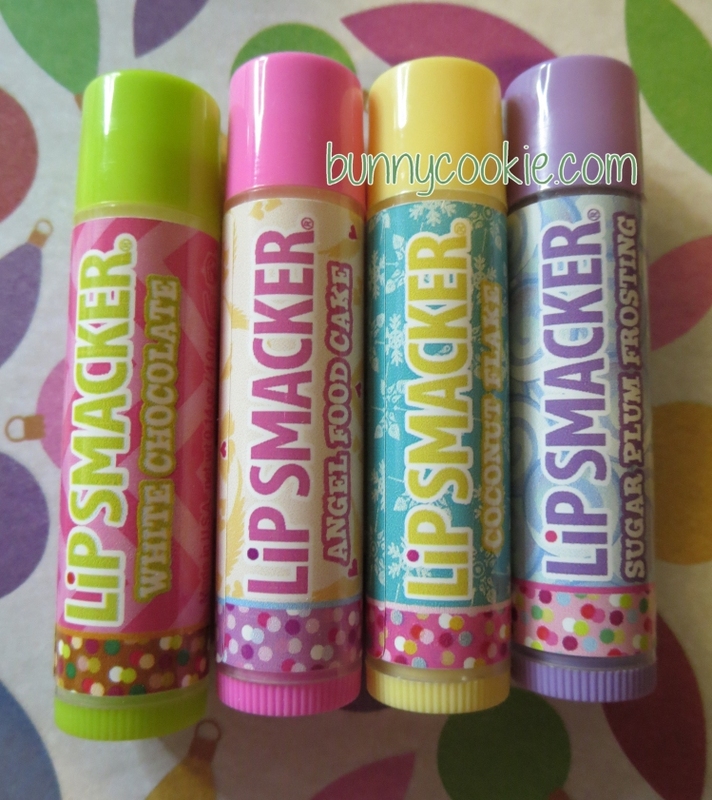 I think Lip Smacker did a good job of making some cool flavors for this Christmas. I wish they would come out with a spearmint or wintergreen flavor. That would be cool. Oooh ooh! How about a mint collection?! Perhaps make a strawberry mint, lemon mint, orange mint, etc! Love the mint idea! They need to work on getting the minty-ness back that they use to master, first. I’ve been wanting a Lime Mint flavor for some time now! And, oh, how I miss the old Crystal Wintergreen! To me, this newer Holiday Punch reminds me of the old holiday Smacker, Fantastical Strawberry from holiday 2002. It’s very fruity and sweet, with a mix of different fruits, and even get a little lemon in there. It’s still really good but it’s not the same flavor as the Holiday Fruit Punch they did in 2011. I like the soft peppermint Lip Smackers. I know it’s not super minty, but I love the creaminess soft sweetness of them. It’s one of the flavors I look forward to every Christmas. I agree, creamy mint does have its purpose. I hope BB uses both types in the future. My assumption is ebay. They seem to have all the new Lip Smackers sold first. Hey Bunny Cookie, these lip smackers are sold on their website. 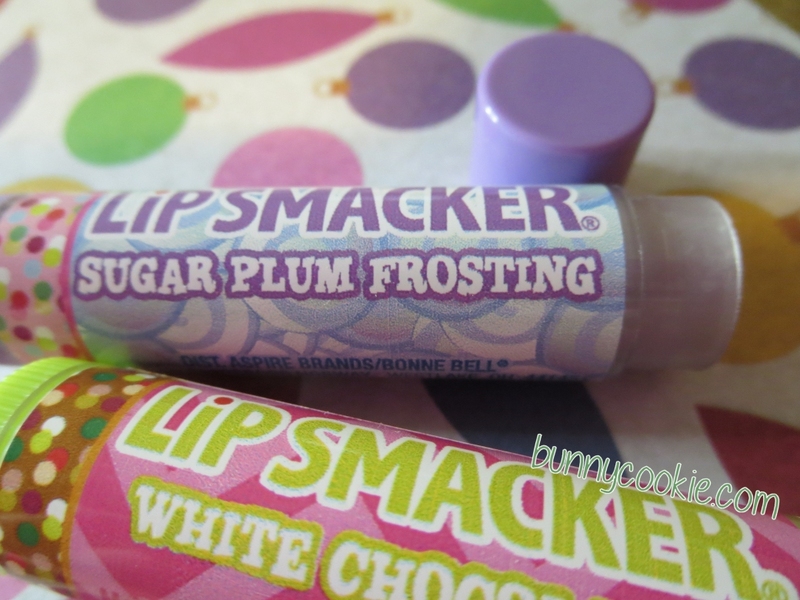 These are in the holiday lip smackers section. I saw they sold them on there a few days ago. I found some of these at Kmart! I bought the Delectable Dessrts collection,the Ice Cream Dreams collection, the Cupcake Crazy trio and the Soda Surprizes trio. In the cupcake crazy trio, there’s an extra flavor that you didn’t review, Bunny Cookie. It’s called blackberry cream. In your opinion, which is better: sugar plum or sugar plum frosting? I am making an order but can’t decide! Get sugar plum. It’s shimmery and it smells sweeter and less headache-inducing (the sugar plum frosting kind of makes me feel sick smelling it!). Thanks a zillion, Renee! 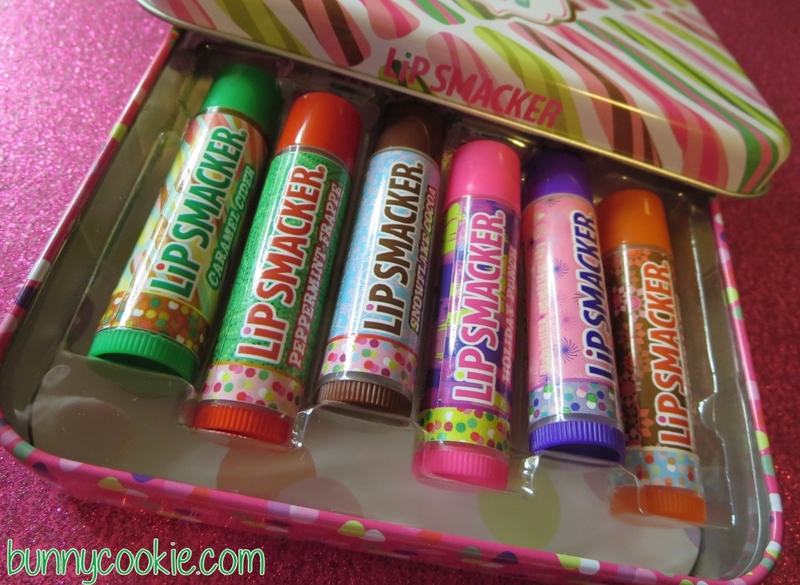 I may or may not have given in and just ordered all of the holiday Lip Smackers… For the sake of collecting, right?! The deliciousness is a major bonus! Haha good choice! Please come back and let us know which one you end up preferring 😀 I really love both but give a slight edge to Sugar Plum as well! I got the Delectable Desserts collection on sale at Kmart for $1.24. I already I got it months before, but hey, I might as well get more than one! I thought it was kind of weird at first that they had a coconut flavor in this collection, but I love it. It smells just like the original and Paul Frank ones. I prefer it over the coconut cake type ones. There’s also another shimmer flavor they had in this one trio I got at Ulta. It had sugar plum (the shimmer one), strawberry sprinkle liquid Lip Smacker with sparkles, and a peppermint shimmer one that I haven’t seen in any other collection. It’s lighter than the current peppermint/candy cane Lip Smackers, but it looks so pretty with it’s shiny red and green label. It’s a shimmer set with the original Lip Smacker labels. Vanilla bean smells similar to the vanilla frosting lip sparkler, and I highly recommend it if you love vanilla. It’s worth getting the non-shiny label set. I also got the Delectable Desserts collection (the non-shimmer one in the pics above) for $0.93 on clearance at Kmart. I got them along with a couple Easter egg trios for the same price. They were on clearance for $1.24, but these rang up even cheaper than that. Hah, I realized I got the Delectable Desserts collection three times! I like all of them except for sugar plum frosting, but I still use it. Angel food cake and sugar plum frosting was also in the Cupcake Crazy trio, which I also got a couple times, so that means I have FIVE of them! I love Vanilla Bean! And no Renee you dont have a problem. I got 5 sets of the Disney Easter Smackers this year for the Bubblegum Frosting and Buttercream Chick. I also bought 4 of the sweet and salty collection for the Vanilla Frosting. Im a total frosting feine! I REALLY like the “Sprinkle Cookie” which came with Buttercream Frosting. I should get a second one of that….. I have about 130 backups and 70 I use currently so I guess I have a problem too. Hopefully the backups don’t lose scent. It seems to me they last a longgg time so I think I’m ok.